Allison Jackson is the founder of Allison Jackson Fitness. 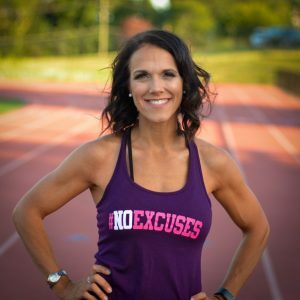 She is passionate about all things health and fitness, but she really loves sharing her knowledge and expertise to help corporate moms get lean eating foods they love so they can be at their best. She knows exactly how hard it is to work full-time, take care of the kids and household…plus try to fit in working out, eating right and taking care of herself, too! Allison has spent the last seven years training and competing in figure competitions — even winning her pro card — so she has a crystal-clear picture of what it takes to get to your ideal weight and stay there. Now she’s ready to share what she’s learned and experienced. Are you ready to transform your body and reach your goals? What does healthy mean to you? Being healthy means feeling good in your own skin. It’s about taking care of your body and your mind. This can be eating healthy foods, getting fresh air and exercise, meditating and ensuring self-care is a top priority. What motivates you to stay healthy and fit? When I feel good, eat right, and work out, I feel so good about myself. It gives me energy, confidence and just makes me happy in general. When you make these things a part of your daily routine, instead of a chore, staying healthy and fit quickly becomes a part of your lifestyle. Why do you think it’s so hard for people to stick to their New Year’s Resolutions? I think people like to choose very big, sometimes overwhelming goals, like to run a marathon or lose 50 pounds. There’s nothing wrong with going big, and I love when people truly challenge themselves, however, having the right plan in place is key. You need to break that big goal down into smaller, achievable, sustainable steps. It’s also important to enlist help when you need it. Sometimes having the right plan or a coach to guide you can make all of the difference in world when it comes to reaching your goal. From running coaches, to weight loss coaches, you can find help for any fitness goal you have in mind. What are some ways you help people achieve their fitness goals? One key element is understanding your “why.” Looking good in a bikini cannot be the only reason. Maybe you want to look the part for a promotion or ensure you can keep up with your kids or your grandkids. When it comes to fitness goals, dig deep and really ask yourself why it’s important to you. That will keep you motivated to achieve your goal. In addition to a strategy, I also provide accountability to my clients. It’s helpful to have someone you know will ask if you worked out or what you ate throughout the day. When you have to answer to someone, it makes you think twice about going off track. Any advice to someone who has recently started on their fitness journey? Consistency is key. Just keep going each day. Make fitness enjoyable and something you look forward to. If you find yourself struggling with either motivation or an overall plan, enlist the help of a fitness coach. The accountability will ensure that you stay on track and reach your goals. At RightFit, we will set you up with a trainer who fits your availability, personality, and budget. Take the RightFit Trainee Survey today and schedule a risk-free introductory session with the perfect personal trainer for you. You can also browse through a list of our Personal Trainers and filter by price, gender, specialty, location, and rating. Give us a shot! You have nothing to lose, and a better life to gain.